Register Log In Britbike forum Forums Bsa bulletin board oil issues? 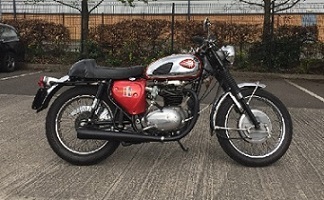 BSA B441 1968 pre OIF. So now I have the thing running, pulling like a freakin train, and making enough noise to disrupt the whole darn neighborhood (cool! ), I thought I better check the oil system. Return to the tank seems just fine, spitting a bit on tick over but a nice steady stream once you give it a bit of throttle. My worry is the rockers. they just don't seem very wet. When the engine was apart I stripped and cleaned them even blew through the oil ways. just how much oil should there be? I was expecting a steady flow but don't want to try to fix a problem that doesn't exist! The oil should always return in intermittent spurts because the return side of the oil pump has higher capacity than the delivery side. The oil to the rockers is also intermittent because the rocker feed pipe takes off of the return line. This pipe is also quite smaller than the return line so flow will be less than back into the oil tank. Something I was taught do from a younger age was block the oil feed line to the tank off with your finger, forcing more oil through to the rocker feed side, this way purging out any air. Hard to tell on an A65 but your B series engine with its inspection caps removed might show if any more oil is reaching the valve area. Thanks for that, will play with it later. I had removed the cover by the pushrods and it looked not exactly wet in there. the gasket is pretty naff and I had expected an oil leak. Will remove the tappet covers and look there. I am fairly new to the unit single world, in this century at least (I used to mess with them 40 odd years ago) but I seem to remember a mod you could do to them to take the oil feed to the rockers from else where, like the B50??? more pressure?? You don’t want too much oil to the top end, which can be another problem, with this you never empty the sump of oil. If your lucky that’ll cause drag at the crank but most likely it will also increase crank case compression and pee out of where ever it can. Its mainly the rocker shafts which needs oil, hence the feed from the return line. As Allan suggests, blocking the oil tank return with your finger will force more oil to the rocker shafts and this was recommended after a rebuild and is still a good idea. Don't forget the rocker box is constantly filled by oil mist blown in from the crankcases, so theres plenty in there. Try running with one of the inspection covers off and you will see how much oil comes out.